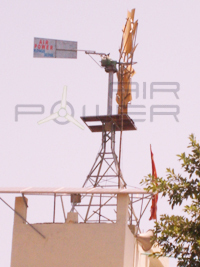 Small Wind Generator, Small Wind Generators, Wind Generators manufacturer in Gujarat, India. Wind is a nature’s free gift and it is a fuel for “AIR POWER”. The geographical distribution of our country is ideal for the small wind mills and it works better in some areas like near by sea shores, on Mountains and in Deserts. Where wind is naturally in large measure. We are pleased to present “AIR POWER” small wind generator which is a unique innovation of “ Indo tech engineers” engaged in a non-conventional & natural energy generation. We have designed it to keep in mind with amazing possibility and consumer needs. We are introducing wide range of small wind generators created by Indian Technology. Our motto is to make economical and continuous power generation for the common citizen. So, that everyone can become an independent producer and consumer of green power energy (electricity). And it is a great alternative of any means of power generator like a solar power cell. Invert or Generator which are more expensive. Wind is a nature’s free gift and it a fuel for “AIR POWER”. The geographical distribution of our country is ideal for the small wind generators and it work better is some areas like near by Sea shore. on Mountains and in Deserts where wind is nature in large measure. Type of load A.C. / D.C. A.C. / D.C. A.C. / D.C. A.C. / D.C.
* select your wind generator according to your total load and every day usage calculated in kw/h. * Due to continuous development specifications may be changed without notice. A pollution free source of electricity production. A high quality and trust worthy product with minimum maintenance. Designed for an easy and safe installation on a terrace or ground. No need of any fuel like Diesel, Petrol, Kerosene or Gas. There is not requirement of electricity connection at the place of installation. Uninterrupted electricity supply provides safety and long life to costly equipments. High quality charging controller with over charge, under charge and cut off system. Highest production with low wind speed. Benefit in Taxation in commercial establishment. Specially designed protection mechanism for high wind speed. We are able to provide 3 phase irrigation pump operating system, 3 HP to 10 HP through wind mill.